Are you looking to stay the night in a treehouse, tucked away in the foothills of the Adirondacks? Maybe a hotel with rooms themed after “The Wizard of Oz?” New York has pretty much anything you can think of as far as unique overnight accommodations go. 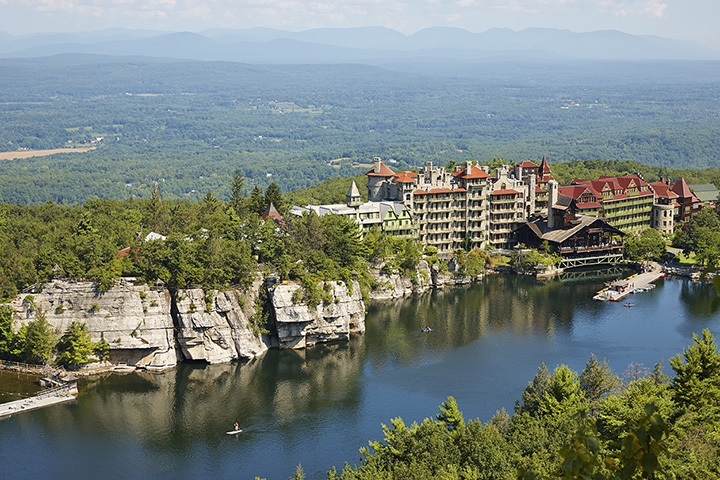 So, if you’re staying in New York and looking for an interesting place to call your home base, check out these 15 unique hotels in the state. Established in the 1800s, this magnificent all-inclusive resort rests on over 1,000 acres of nature. Many of the rooms in its Victorian castle have balconies and fireplaces, and the hotel’s grounds are a Hudson Valley paradise. The site includes 85 miles of hiking trails, swimming pools, an 18-hole golf course, an ice rink, restaurants, and a full-service spa. This AirBnb rental is located just nine miles from Saratoga in the foothills of the Adirondacks. The cozy, simple, secluded hotel is an actual treehouse in the woods, with a covered porch, a wooden deck, and a winding staircase that leads to the sleeping area. Located inside a New York City landmark building, The Jane is a boutique hotel experience unlike any other. Every room is designed to look and feel like part of a 1920s ship cabin, which pays homage to the building’s origins as a hotel for sailors. Captain’s Quarters feature either Hudson River views or a large terrace. A May-October retreat, Firelight Camps is designed to mirror African luxury safari tents, and is just steps away from the trails of Buttermilk Falls. Each “elevated camping” tent comes with comfortable hotel-style furnishings, and there is a common campground where visitors can enjoy complimentary breakfast and socialize. Just two blocks from the gorgeous Grand Central Terminal, Library Hotel is a boutique hotel with an old-fashioned library theme. The interior features gorgeous wood paneling and bookshelves, as well as tasteful art, a rooftop lounge, and several tasty eateries throughout. This cool Catskills motel is full of intensely creative rooms, each with its own unconventional theme. One guest room at the Roxbury has a “coconut cream pie” themed, while another is inspired by “The Wizard of Oz,” complete with a yellow brick road. The Roxbury is immersed in peaceful nature and is illuminated with colorful neon lights at night. Those looking for a luxury farmhouse experience will find it at The Emerson House. Designed and built by the famous artist Rockwell Kent, the house is filled with beautiful art and tasteful décor. Asgaard Farm is a working farm, with delicious farm-fresh cheese and goats roaming the premises. This lavish castle estate was built in the early 1900s by investment financier Otto Hermann Kahn. The Long Island castle has 32 extravagant guest rooms and expansive gardens, hosts A-list weddings, and is on the National Register of Historic Places. A Japanese capsule-style hotel, this Times Square building is clean, simple, conveniently located, and affordable. The hotel rooms (called “capsules”) are inspired by “luxury aircraft design” and aim to produce a “wow-factor.” Yotel has a large terrace with amazing views, complimentary breakfast, and the North African restaurant Green Fig. For those adventurers who want to know what it’s like to sleep in a train car, there is Caboose Motel. This hotel, with five restored 1916 train cabooses serving as guest cabins, offers an authentic sleeper train experience just a few miles’ drive from the wineries of the Finger Lakes. One of the cheapest hotels in Manhattan, Carlton Arms is a budget hotel with a zany, art-filled atmosphere. Street art and unique figurines adorn nearly every corner of this space, and many of the hotel rooms share a unisex bathroom. Those looking for cheaper accommodations and a taste of New York City art will love this midtown gem. Lovingly created by Peter and Toni Ann Wing over the course of 40 years, Wing’s Castle was their “live-in art project.” Now an adults-only bed and breakfast, this unique Hudson Valley retreat is an actual stone castle filled with fascinating trinkets collected over the couples’ lifetime. Accommodation options include a tower room, a dungeon room, and a fairy tale cottage. The Standard Hotel is ideally located in the meatpacking district, which is one of the hottest neighborhoods in the city. Steps from the High Line, every room in the hotel has floor-to-ceiling windows and sweeping views of the Hudson River or the Manhattan skyline. The Standard has several top-notch restaurants and a rooftop nightclub on site. CitizenM is an affordable, arty hotel chain designed to give guests a boutique hotel experience for less money. The hotel is located in Times Square, and has a rooftop deck with expansive views, a 20th floor gym, delicious food available 24 hours a day, and plush guest rooms. Located in the heart of downtown Buffalo, this historic mansion was restored in 2001 and transformed into a luxury boutique hotel. The stunning red building contains 28 beautiful and contemporary guest rooms. Expect 24-hour butler service, complimentary cocktails, a chauffeur, plenty of natural light, and fireplaces.